I am in absolute disbelief that I am HALF WAY through my pregnancy! Since I’ve announced I was expecting I have connected with so many of you. We’ve talked about our pregnancy woes, motherhood, struggles and it has been absolutely incredible to share so much of my life with you and learn so much about yours. Thank YOU all from the bottom of my heart for your kind messages, support, but mostly for sharing your lives with me. As I’ve shared with many of you, I had a very rough trimester but thankfully the second trimester is progressing much better!! With that said, I wanted to let you in on some of my pregnancy must haves! I’m sure as I try more products and get further along in my pregnancy- I’ll have more suggestions so look out for a faves part 2! If you have any specific questions please please email me at palak@thechutneylife.com! This oil is easy to use, has a pleasant smell and makes for a quick and easy application all over the body. It is known to help with skin elasticity and everyone who has used it- has told me they never saw a single stretch mark- so I am a believer! This cream is created by a dermatologist- which is a huge plus! The consistency is like fluffy soufflé and it delivers a TON of moisture. I seriously love love the glow that it gives my skin! I apply this from head to toe (I layer the bio-oil on top of this on my belly only). 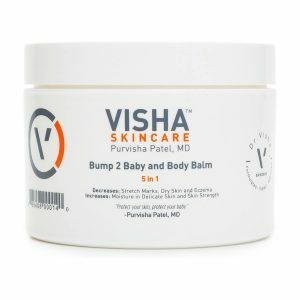 Since I’ve been pregnant I’ve been exclusively using the Visha Skin Care Mommy Line!! I have noticed brighter-more even skin tone and I feel comfortable knowing that this line was created specially for mommies by a dermatologist! When I discovered maternity leggings, I knew my life would never be the same. No joke, when your belly is growing and nothing in your closet seems to flatter you-leggings are a life saver. I didn’t want to spend a crazy amount on maternity wear until I figured out what I really needed and liked- but you can’t go wrong with everyday basics. These are great for layering during the fall and winter months and you can use cardigans/duster sweaters you already have in your closet to complete the look without having to buy a ton of crap. These leggings were the first maternity clothing I bought! They are soft and cozy and aren’t too snug around the belly which at times I prefer! 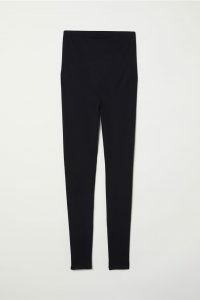 These Blanqi leggings have more of a stretchy snug fit ( similar to yoga pants) compared to the H&M leggings which are more of a soft cotton material with a bit of a relaxed fit. It’s all preference really! I usually wear the H&M ones a bit more casually and then the blanqi ones when Im out and about! 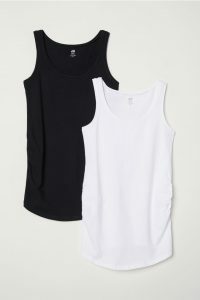 These tops come in various colors and are super duper SOFT and comfortable. I like that the white is thick material so it’s not at all see through and it really does grow with your belly. I bought mine in XS and it still has a ton of room for me to grow in! Ok this might not be a wardrobe “staple” but during those first few months of pregnancy when you are bloated AF and uncomfortable- you are going to wish you had some of your mom’s nightgowns! 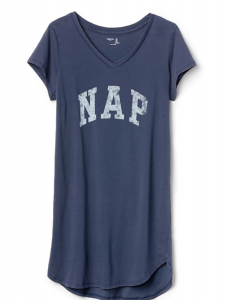 These t shirts are so so soft and I find any excuse to lounge in them all day! Getting Comfortable: The Pillow I can’t live without ! Once my belly really started to pop, I found it to be quite uncomfortable to sleep. One of my girlfriends recommended this giant obnoxious pregnancy pillow to me and it hasn’t left my bed since the day I purchased it. This pillow provides you with cushion in places you didn’t even know you needed cushioning!! Its especially helpful to place between your knees and also to cuddle and rest your growing belly on when you’re sleeping on your side. The cover is washable – and I will warn you it takes up a lot of space so probably best to use if you sleep in a king bed with your significant other- it is SO SO SO worth it.